Questions? Contact Dani Kuepper, Artistic Director, via email. Questions? 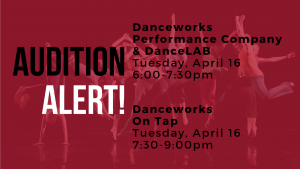 Contact Amy Brinkman-Sustache, Artistic Director of Danceworks On Tap, via email. Have 3+ years of dance experience? Interested in unique performance opportunities, working with fellow youth artists and advancing your dance technique with professional dancers at Danceworks? If so, consider auditioning for Danceworks Youth Performance Company’s 2019-2020 Season. DYPC has three levels of participation. All DYPC dancers study at Danceworks and are placed in appropriate levels for each style. DYPC members become featured youth performers in creative new works of dance that are then shared with the community. Season begins in September 2019. 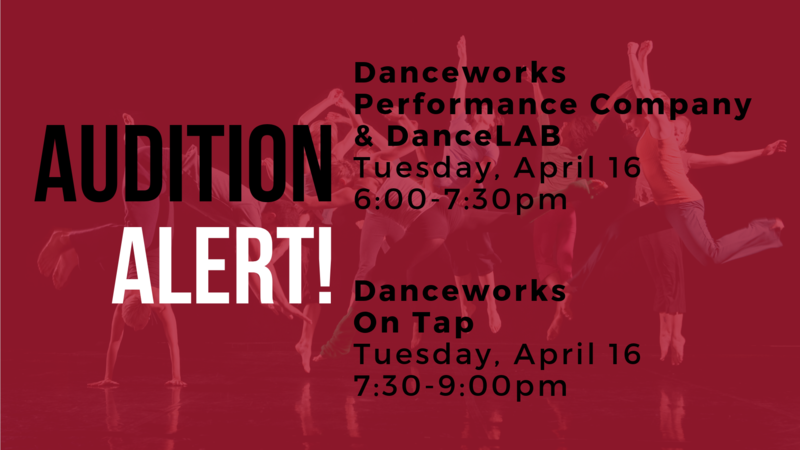 All who audition will receive valuable feedback from Danceworks faculty regardless of whether or not you are offered a spot in the company. Questions? Contact Gina Laurenzi, Artistic Manager of Danceworks Youth Performance Company, at 414-277-8480 ext. 6003 or via email. Please check back for ISS audition opportunities. Click here to learn more about studio scholarship and work-study opportunities.